Investment: $45. Early bird $40 thru Feb 15, 2019. Join Hema Jagada in this ayurveda intensive where we will explore and learn how mung beans are a super food and excellent source of nutrients. You might have heard of Mung beans how good they are for you. You may even have made your Khichri because you heard it’s good for you. But do you know there are countless other ways you can use Mung beans? We can sprout them, grind them, soak them, dry them, sauté them, puree them, and anything else! Mung beans are a staple of Ayurvedic nutrition, and they have been used for thousands of years to restore health and vitality. Come and learn about these marvelous little beans and get comfortable with their unique characteristics. Packed with a nutritional profile like no other, Mung beans are slowly becoming the new super food, and we will get hands on with these gorgeous little beauties. Before you leave, you will know how to use Mung beans and see the various stages of sprouting them. 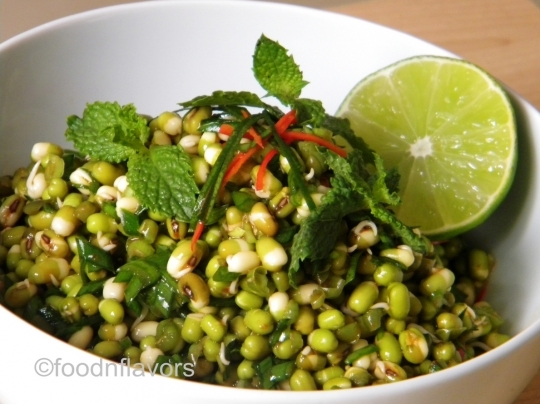 A sprouted Mung bean salad for lunch is included. Restore Simply is owned and operated by Hema Jagada MSc ALC. The brand reflects her purpose of helping others to live a more intentional and mindful lifestyle, with simplicity at its core. After taking charge of her own healing and health recovery using a multi-dimensional approach centered on 5 factors; a plant-based diet, good quality sleep, time spent in nature, body appropriate exercise, and nurturing self-care practices, Hema created Restore Simply to help clients live a life of purpose, passion, and vitality. Hema’s products are created from the Ayurvedic wisdom: you are what you can digest. Spices have been a central theme to Hema’s culinary life, and are one of nature’s best gifts for helping the body digest and assimilate nutrients from the food you eat. Abundant with anti-inflammatories, and anti-oxidants, spices should be an essential part of the modern lifestyle. Every one of Restore Simply’s products are carefully created in small batches to maintain the integrity and quality of the blends; and the growing client base is a testament to this. Restore Simply’s products are available online and through various locations throughout Dallas/Fort Worth. Hema conducts hands-on workshops, and teaches Ayurveda for the modern lifestyle throughout the Dallas area. When she isn’t immersed in Ayurveda and spices, she loves being a soccer mom, and mom to her high schooler. Hema is also a certified Montessori educator, and lives in Plano with her husband and two children.